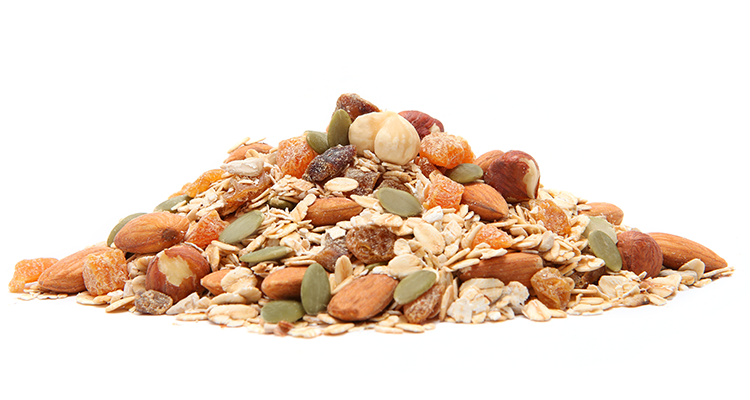 Deluxe Natural Muesli has a traditional base of oats, whole nuts and seeds. Perfect as a bircher muesli or smoothie base; or just with milk as a traditional natural muesli. Wholegrain Oats, Pumpkin Seeds, Dried Apricots (Apricots, Preservative (Sulphur Dioxide)), Almonds, Hazelnuts, Dates (Dates, Rice Flour), Golden Raisins (Raisins, Sunflower Oil, Preservative (Sulphur Dioxide)), Sunflower Seeds. Contains gluten, sulphites and tree nuts. May contain traces of egg, milk, peanuts, sesame seeds, soy and other tree nuts.